How to order and receive stock – How can we help? Note: It is also possible to import products into an order using a CSV file. This article will explain how. Head to Products -> Stock Control and select Order Stock. This will direct you to the page New Purchase Order. 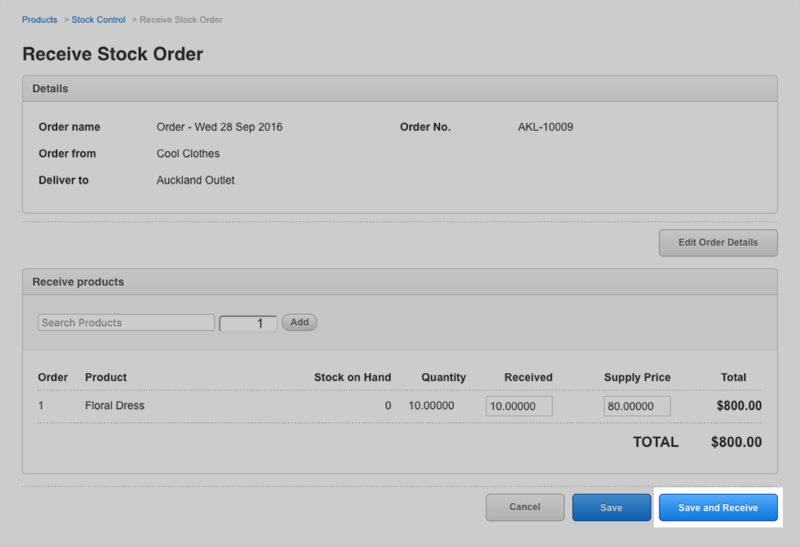 Select the supplier you are ordering stock from the "Order from" drop down field. Choose where you wish to have the stock delivered to by clicking on the "Deliver to" drop down menu. Choose a name /reference which will be used to identify this order. Note: The product will not be automatically reordered if it exists in another open or sent order for the same outlet. Add products by typing in the product name in the search box; Vend will bring up the product, and if there are several similar products, click on the correct one. Enter the quantity of this product that you would like to order. Click 'Add', this will create a line in this window showing the details of your order including the cost of the stock. If you have set up or are using barcodes for your products, you can add your products by scanning your barcodes; just ensure that you have selected the product search box before scanning. Keep adding products until your order is complete. Once complete, click 'Save' to save your changes or 'Save and Send' if you are ready to send it off to your supplier now. How do I add products from different suppliers to the same order? When you create an order for a specific supplier, only products attached to this supplier will be available to add to the order. 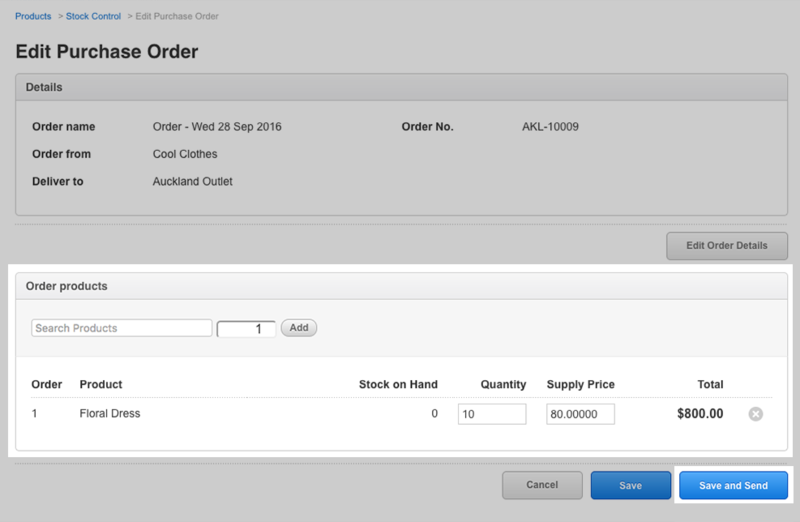 To add any product, by any supplier, to an order, you will need to select 'any supplier' from the 'Order From' dropdown when you create a new order. Note: If you create a product, but set the 'supplier' field to blank, you can add this product to any order generated under a specific supplier. If you want to send a purchase order that is currently open, navigate to the 'Stock Control' screen and select open orders from the left-hand drop-down menu. When you are happy to send the order, you can click "Send" to email the order, otherwise click the link, "Mark as sent". If you are emailing the order, complete the required fields with the relevant person's contact name, email, subject and message. The status of this stock transfer will now be changed to 'Sent'. To receive a partial order, you can follow this article. To return to the main 'Products' page, click on 'Products' at the top of your screen. Important: If you want to print barcodes for a received order, the number of labels will be determined from the received amount, not the amount ordered - unless the received amount is 0 and in this case, it will revert to the ordered amount.